A logistics and warehousing company came to Weltman & Moskowitz, LLP, a New York and New Jersey business litigation law firm, because it believed it was wrongfully named as a defendant in a multi-party federal lawsuit commenced in the Southern District of New York by the insurer subrogee of the consignor. 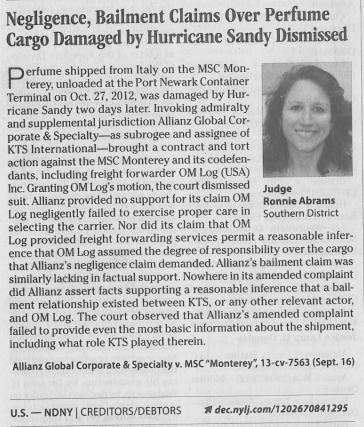 The insurer alleged that our client had acted as a freight forwarder and bailee with respect to certain cargo damaged by Superstorm Sandy in October 2012. Weltman & Moskowitz formulated a proactive and aggressive strategy to isolate our client and get it removed from the case as quickly as possible. We filed a motion to dismiss the complaint for failure to state a claim under Rule 12(b)(6) of the Federal Rules of Civil Procedure. Plaintiff then amended its complaint, after which, we filed a motion to dismiss the amended complaint. In the motion to dismiss, we argued, among other things, that plaintiff improperly sought to expand the Company’s limited role in the transaction and impose liability based on wholly conclusory and unsubstantiated allegations. The Court held oral argument in early September and thereafter issued its order granting the motion to dismiss the amended complaint. In fully dismissing the claims for failure to state a cause of action, the Honorable Ronnie Abrams, U.S.D.J., agreed that the amended complaint lacked the requisite factual support for the pleading. With respect to the negligence claim, the Court stated that the plaintiff failed to allege any facts to allow for the reasonable inference that the Company “assumed the degree of responsibility for the cargo that Plaintiff’s negligence claim demands.” In addition, the Court agreed with the defendant’s opposition that the complaint was too conclusory when it initially stated that the defendant actually controlled the cargo, much less served as a forwarder or bailee. For a copy of the Memorandum Opinion and Order, please click here. On September 23, 2014, the New York Law Journal featured a report on Judge Abrams’ decision. The image above is from that report. 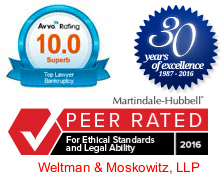 Richard E. Weltman and Michael L. Moskowitz co-founded Weltman & Moskowitz, LLP, in 1987. A business litigation, creditor’s rights and bankruptcy law firm, Weltman & Moskowitz serves clients throughout New York, Long Island, New Jersey, and beyond. The firm focuses on lender’s rights, corporate reorganization, resolution of commercial disputes, loan workouts and modifications, shareholder and partnership disputes, business divorce, dissolution, business and bankruptcy litigation, arbitration, and mediation of all types. The firm also assists with corporation, partnership, and limited liability company governance, and preparing and negotiating many types of secured lending, leasing, shareholder, buy-sell, consulting, technology, and joint venture transactions. Michael and Richard may be reached at (212) 684-7800, (201) 794-7500, or via email at mlm@weltmosk.com or rew@weltmosk.com.